Beautiful 3-bedroom apartment in Long Bien. This brand new 3-bedroom apartment in Long Bien is an excellent location on Ngoc Thuy Street, very close to the French school. It has a perfect design on a total of 125 square meters. Long Bien apartment has 3 warm bedrooms plus a working room, 2 bathrooms with bathtub. The living room is superbly decorated and the concept is very bright for a nice dining area, the kitchen is modern and well-equipped with a refrigerator next door, built in an oven and microwave. Prices include internet, cable TV, water. Please send us your requirements. A superb apartment for rent in MIPEC Tower, Long Bien. Both the landlady and the landlord are interested in art, interior design so all furniture is selected carefully. Everything, even small details like glasses, hand-made flowers, genuine pictures is arranged passionately by them. From the sitting room, it captures the stunning view of the Red river and Hanoi City. The size is about 88sqm, cozy and fitted. Feeling home is what the apartment gives you when living there. Kindly contact us to view the property. 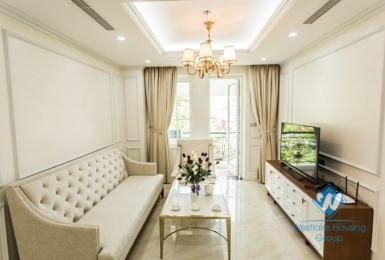 Luxury two bedrooms apartment for rent in city center, Hoan Kiem district, Ha Noi. It's size 120 sqm, two bedrooms, two bathrooms with standing shower cabin and bath-tub, livingroom shared open kitchen and dining area. It's fully furnished by modern and luxury furniture and equipment. Please contact us now to have a look ! Luxury 2 bedroom apartment in Hai Ba Trung nearby Vincom Center Ba Trieu. Living space of 100 sqm, composing 2 bedrooms, 2 bathrooms, a kitchen and a living room. The apartment is furnished, modern, good quality furniture. It is modern, clean, good service. The building is located near Vincom tower where is convenient area. It is easy to get taxi, few steps to go to shops. The price is inclusive of Internet WiFi, cable Tv, city water and cleaning service 3 times/week. A luxury house in Long Bien is available for rent now. There are 4 floors with the living size is 80 sqm including of 3 bedrooms, 2 bathrooms, 1 living room and 1 open kitchen. Surrounding the house is a little yard and space for plants and pets. It’s fully furnished with nice well-designed furniture and decorations. All the rooms are bright in sunlight thanking to glass windows. Perfect location, very quiet place and convenient to go to shops, stores, restaurants… Do not hesitate to call us for a viewing. Well design two bedrooms apartment for rent in Ho Ba Mau, Dong Da,Hai Ba Trung district, Ha Noi. It's located at quite area, face to Ba Mau Lake. Total size 110 sqm with two bedrooms, two bathrooms, living room, open kitchen and balcony. It's fully furnished with good furniture and equipment. For more information please contact us now ! This modern apartment is located on Linh Lang street, right in the heart of the Japanese expat community, walking distance to Lotte Tower and Thu Le park, as well as restaurants, minimarts, cafes, etc The apartment is about 55 sqm large consisting of one bedroom, oplen floor plan living room with kitchenette and dining area. It comes with full furniture, cleaning and ironing service, Japanese cable channels, tap water, internet wifi. For more information, please kindly contact! A resonable 6 bedroom house for rent in Ba dinh, Ha noi. The total living space is 400sqm, with living room, kitchen, 6 bedrooms, 5 bathrooms and a rooftop. It is locatedd in center of Ba dinh, near many restaurants, shops, local markets... and it's easy to get around Ha noi too. Call us now for more information. Bright and clean apartment for rent in Truc Bach area, Ba dinh district. The apartment has 135 sqm including 03 nice bedrooms with many widows, 02 bathrooms with bathtub and standing shower cabinet, A lager living room combine with opened kitchen area. New and nice lake view two bedrooms apartment for rent in Ho Ba Mau,Hai Ba Trung Ha Noi. It's located at 6th floor, bright with nature light and airy, fully furnished with modern furniture and equipment. Please contact us to have a look ! A luxury 2 bedroom apartment in Hai Ba Trung district is available for rent now. The size floor is up to 160 sqm including 2 bedrooms, 2 bathrooms, 1 living room and 1 open kitchen. The furniture is in high quality with modern design, brand new. The atmosphere is fresh and airy because of big glass windows surrounded the apartment. It’s located in the main street, 5 minute walking to the Thong Nhat Park. Feel free to contact us to view this property. Luxury and Morden 2 Bedrooms Apartment For Rent In Van Ho 3, Hai Ba Trung area. This one located on center of Hai Ba Trung district, very convernient to go anywhere you want. The apartment on the 4th floors with the size is 120sqm, included spacious living room, opened kitchen, large bedrooms with natural lights, 2 bathrooms and nice balcony. CALL ME TO SEE THIS ONE ! Brand new two bedrooms apartment for rent in Hoan Kiem district, Ha Noi. Total size 85 sqm with 2 bedrooms, 2 bathrooms, livingroom and open kitchen . It's fully furnished with all new and modern furniture and equipment. This building located in center of Ha Noi, near by many restaurants, coffee shops, business center and so on. Price for rent 1000 USD/month included Cable TV, Internet Wifi and cleaning service 3 times per week. Please contact us now to have a look ! An elegant 100 sqm apartment for rent in Hai Ba Trung district with 2 bedrooms and 2 bathrooms and a large balcony. Nicely done in luxurious and modern style, the apartment will provide you the comfort of a home right in the city centre of Hanoi. From this building you can find restaurants, shops, minimarts, cafes, Thien Quang lake and Sword lake, and other modern amenities in walking distance. For more information or booking please kindly contact us! Spacious 2 bedrooms apartment with a lot of natural light for rent in Hoan Kiem district, Hanoi. This apartment located on 5th floors of the building. The size of this one had 100sqm with living room, closed kitchen, 2 bedrooms, 2 bathrooms. It's fully furnished with good quality. It's located on good area to closed to Hoan Kiem lake, go to shopping ... Call us to look ! A gorgeous 2 bedroom apartment in Hoan Kiem area is available for rent now. The size is 85sqm including 2 bedrooms, 2 bathrooms, 1 living room and 1 open kitchen. The furniture is high quality with modern design, quite brand new and airy atmosphere by natural light through glass windows. A small balcony is a nice spot for the apartment. It’s located in a small street, 5 minute walking to the Hoan Kiem Lake. Feel free to contact us to view this property. Nice apartment for rent in Hoan Kiem District, Hanoi with 02 bedrooms, ensuite 02 bathroom, open concept kitchen and dining area. It is fully furnished and equipped. This apartment has all it takes to be a good home. Very well located in the central district of Hai Ba Trung, Ha Noi, serviced and newly built building with exellent service. The apartment has 2 bedrooms and 2 bathrooms, a large living and dinning space, and a nice balcony with city view. Furniture are new and in good condition with a modern & elegant style. Modern apartment for rent in Golden Westlake, located is on the high floor, very close to Hanoi center. The apartment has 02 double bedrooms, 02 bedrooms, large living room, dining space and modern kitchen, beautiful balcony view to the city. The apartment has lots of glass window makes the room lots of natural light come inside. Bright apartment with 03 bedrooms, 02 bathrooms, spacious living room, separate kitchen.